I'm hoping you're finding joy in each of your days. I tend to loose track of some of my necessary belongings. Keys. Wallet. Datebook. Those are the usual ones. I don't worry too much. Just retrace my steps and look a little deeper. I don't get too worried and definitely don't get mad at myself for this happens when my life is a little too busy. It came to my mind last week when making an appointment with my boss that I did not have my datebook with me. I then did not find it at home. I did not find it at my studio. A call came and a nice voice asked me if I was me. "Yes, I am!" It was a woman from a credit union. It was one I'd been in the entrance of the night before when Brian used their ATM. I'd seen a nice display of business cards. Two posting ago I did an inspirational one about my business card. Thinking mine would look nice up on the board I rooted around in my big tote bag to find one. Apparently I pulled my green date book out and by accident left it on the little counter beneath the bulletin board. When the head teller of the credit union found it she related to me on the phone, "I opened it, saw it was a date book and found a whole bunch of fairy drawings on index cards. I went back to the entry way to find any clues to who you might be and found your business card hanging up. Your web site led me to you." I thanked her. Later that day I popped in to pick up my book. A woman saw me enter, picked up my book and handed it to me. It was my new friend; the head teller. We had a nice laugh over the exchange and she said "The evening I found your book we employees had just completed a group activity to give us inspiration. The leaders gave us all green 'dream' books. When I saw your green book in the entry way I thought it was one of those." I thanked her for transforming my date book into a dream book and took her business card. 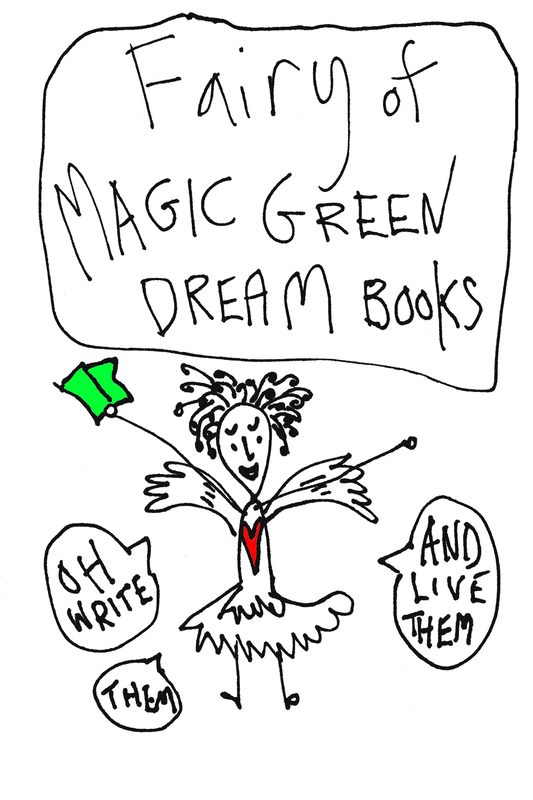 She's going to share 'The Fairy of Magic Green Dream Books' with her co-workers. And I'm sharing her with you. I feel strongly that as we enter deeply into autumn it's time to write our dreams. Then they'll manifest through winter and start growing. Brian and I are locating pretty places for inspirational planning time. Find the time. Find the inspirational places. p.s. The drawing for the September Arts Riot Truck Stop Raffle took place 3 days ago. The winner is Chris D. She won the fairy deck. Congratulations to her and thank you ALL for participating. There will be more raffles and I'm always here with Fairy Decks for you and much more. We believe in the power of "Earnest Little Drawing that Help You Do BIG things!" Whenever I’m inspired I share inspirational thoughts about a fairy, a demon or the growing history of Bluebird Fairies. Enjoy! Sign up here to receive an email notice when I post something new here.